The American food supply has undergone a revolution, moving away from a system based on fresh, locally grown goods to one dominated by packaged foods. How did we learn to trust that food preserved within an opaque can was safe and desirable to eat? 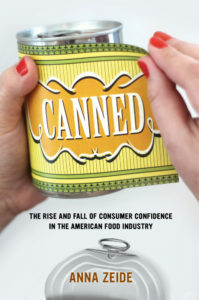 Acclaimed author Anna Zeide reveals the answers through the story of the canning industry, taking us on a journey to understand how food industry leaders leveraged the powers of science, marketing, and politics to win over a reluctant public, even as consumers resisted at every turn. The event is free and open to the public. Copies of “Canned” will be for sale.